Survey Solutions v19.04 brings a number of notable improvements and changes to the CAWI mode that can simplify how large CAWI and mixed mode surveys are administered. A system of reminders will notify the respondents that they haven’t started or haven’t finished their web interviews. Access to the web interviews is now password protected (optionally) providing additional confidentiality protection to the respondent’s answers. The Survey Setup page indicates which surveys are currently accepting web responses. As before a survey may accept responses from the internet (CAWI) and from the tablets (CAPI) with aggregation into a single export data file. As before you can create a landing page where all respondents will start interviews and interviews may be finished in several sessions. Multiselect combobox is new compact representation of the multiselect question. It is most useful when the items are numerous (max 200) and lengthy and inconvenient to navigate. For example, the list of political parties, agricultural crops, or other similar items. The selection is done with the help of a combobox control. 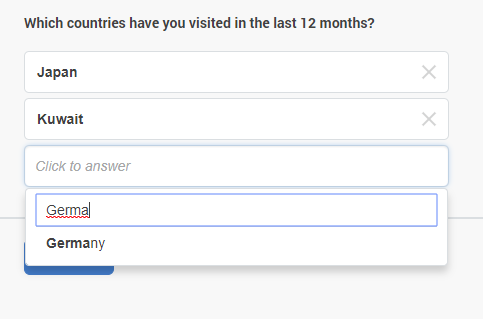 The interviewer first searches for a category, then posts it to the multiselect question. Each category may be added only once to the selection and will not appear in the search results if it is already posted as a selection. The syntax of expressions and export format is exactly the same as for a regular multiselect question (with checkboxes). Cascading with list of categories. Cascading selection is a useful questionnaire element, which allows selecting an answer category from a large number of choices in a sequence of refinements, selecting from a smaller number of alternatives. It is typically used for selection of an occupation, industry, or another similar selection. Prior to this release, elements of cascading selection were presented as combobox questions, which required the interviewer to start typing the selection before being able to pick it from the list. Now the selection can be made directly from the list, provided that the list of categories is no more than specified by the designer of the questionnaire (max 50). If the number of choices happens to be more than the specified threshold, the control automatically falls back to the old behavior and is presented as a combobox. In other words, the new representation of the cascading question shows lists of items at each level of cascading as a series of single choice questions. New behavior allows more streamlined and intuitive input, especially for the cases where the choices at every step are few, such as moving from 1-digit to 2-digit to 3-digit to 4-digit industry classifications, with a choice from no more than 10 alternatives at every step of the cascade. In exported data files the date and time will be written exactly as the interviewer has seen it when the timestamp question was answered. This has been frequently requested as more intuitive format, rather than the earlier export with adjustment into a single time zone. In exported data files the numbering of items in rosters triggered by numeric questions is starting from zero. For example, if you have a roster employees triggered by a numeric question NumEmployees, it will contain a numeric employees__id variable with the values 0,1,2,… This is consistent with how Survey Solutions was recording this information for a long time, though recent versions started numbering with 1 for such cases. We have restored the original behavior. 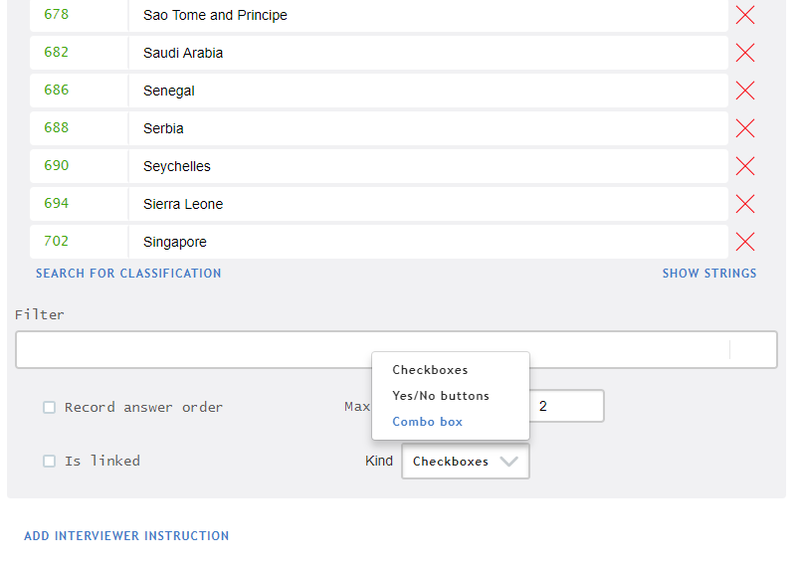 The linked questions will contain exactly the ID value of the selected item, regardless what the base for numbering is. The status duration report is now available to the supervisors, not just the HQ users. Some of the Designer compilation error messages are now more verbose about the exact limit and the current value, for example the estimation of total number of roster items in the questionnaire. Thanks to our Uruguayan user Ms. Alicia Ortiz Perez we’ve managed to improve the reliability of the data export procedures in cases of local server installations with certain regional settings. Thank you for providing the helpful inputs into this investigation! (!) Version 19.04 is the last version of Survey Solutions that will be compatible with Android OS prior to version 5.0. Please keep this in mind when planning new surveys and when purchasing tablets for your upcoming surveys. Current users should either update their devices to OS Android 5.0 or migrate their Interviewer App installations to the new devices with Android 5.0+.